The complete cathode ray tube is shown here with the fluorescent coated screen on the right-hand side. 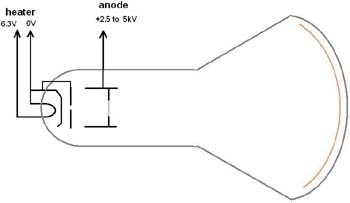 The anode connection is via the plug on the neck, seen here above the electron gun. The exit hole in the gun anode can be seen below. There is a fine mesh grid supporting a layer of graphiticised carbon across the aperture. The beam of electrons passes through this fine mesh on its way to the luminescent screen. The electrons interact with the atomic spacing of the carbon atoms to produce the interference patterns observed. This suggest electrons have 'wave-like' behaviour. The required electrical connections are shown in the diagram on the right. The picture on the left shows the fluorescent screen image on a Teltron T555 tube. 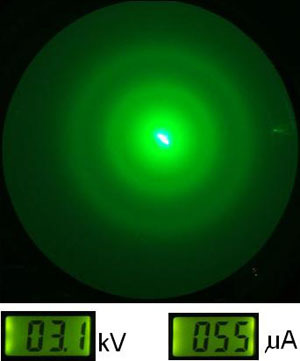 The centre bright spot is the straight through electron beam. The circles around the centre spot are produced by electron diffraction. The anode voltage and beam current are also shown on the digital meters. The applied heater voltage is 5V. Varying the anode voltage varies the diameter of the ring pattern. Increasing the voltage decreases the diameter. 'Mouse-Over' the picture to change the anode voltage. 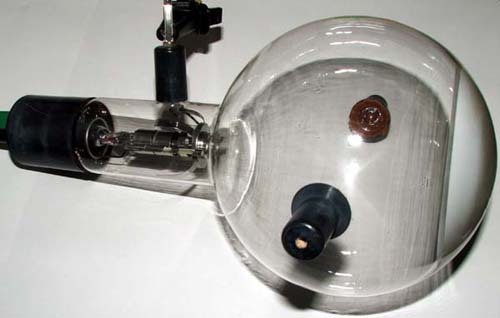 Conversly, the Perrin cathode ray tube is devised to show that electrons are charged particles. A video showing the Perrin tube in operation can be seen by 'clicking' on the video icon below.